Day 74 – More Ethernet Ports! After Aaron made the NAS he ran into an issue that issue been that there was no way to connect the BreezeLite, intel NUC, the NAS itself and our laptops. 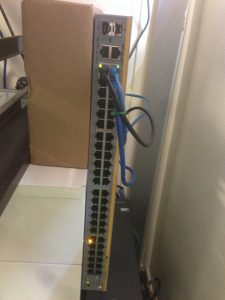 Aaron came up with the idea using a network switch in order to connect all the drives togeather. After changing the IPs on all the BreezeLite and the NUC to static IPs the BreezeLite that is running Windows 10 can connect to the NAS, however, a bit more work is needed to make the ubuntu NUC connect to it.